This season (2018/2019), the St. Augustine Art Association marks its 95th Anniversary with an array of art happenings at the STAAA Art Center and around town, starting with a Parade of Art! Selections from the organization’s expanding Permanent Collection will be showcased in rolling exhibitions of landscapes, portraits, abstracts, still-lifes, maritime paintings and St. Augustine scenes by Emmett Fritz, Tod Lindenmuth, Harold Etter and other well-known artists, past and present. “Art Adoptions” for works in need of restoration will be presented intermittently to entice patrons to preserve these treasures for future generations. On a cold night in January 1924, a handful of artists gathered around the fireplace in the historic Fatio House to form an art group that would ultimately become known as the St. Augustine Art Association. Identified early on as the Galleon Club, a reference to the town’s Spanish heritage and symbol of discovery, these visionaries hoped to create an environment that would encourage artists of all genres to participate in the expressive arts. 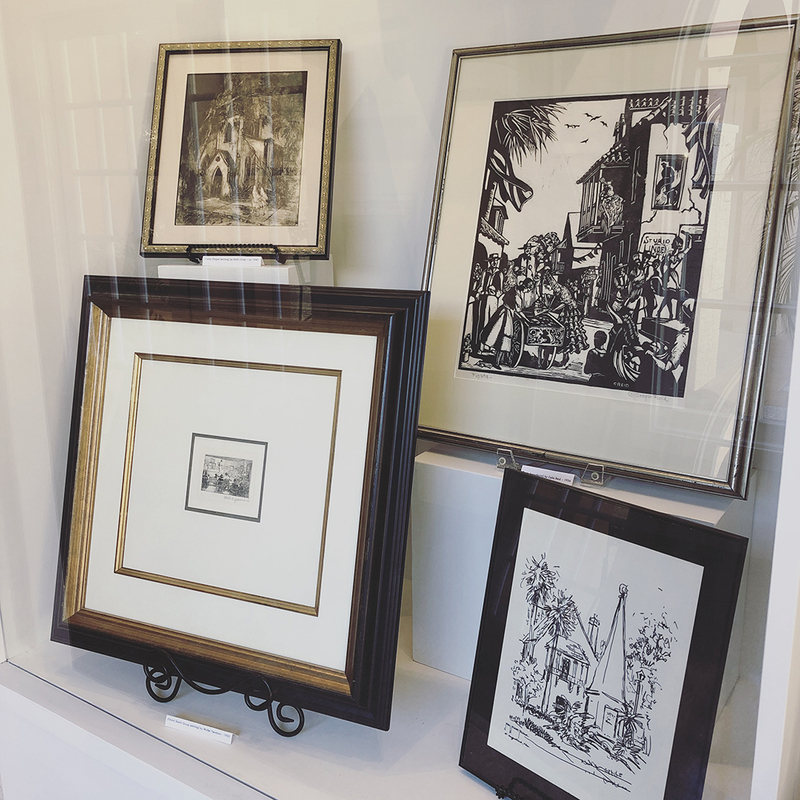 Who could have imagined their humble beginnings would grow into a world-renowned destination for fine artists with the St. Augustine Art Association at its cultural epicenter? The first piece we chose to display in this month’s “Starting Small” (Sep 7-30) was Celia Gregor Reid’s linoleum block print, Fiesta. 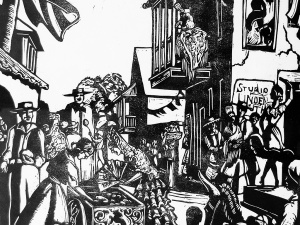 This particular print commemorates the Avilés Street Festival “Day in Spain” held on March 19 & 20, 1948. Reid served as the chairman of Festival design and decoration. In this print, she placed emphasis on surface design and patterns with a strong contrast of black and white. Reid offered this print to fellow artist, Tod Lindenmuth–whose studio can be seen in the right of the image. The Lindenmuths later donated “Fiesta” to STAAA for its Permanent Collection. Celia Gregor Reid, 1895-1956, was a painter & printmaker from Springfield, Kentucky, who trained in the UK and later studied at the Art Institute of Chicago, the Carnegie Institute, and the Maryland Art Institute.